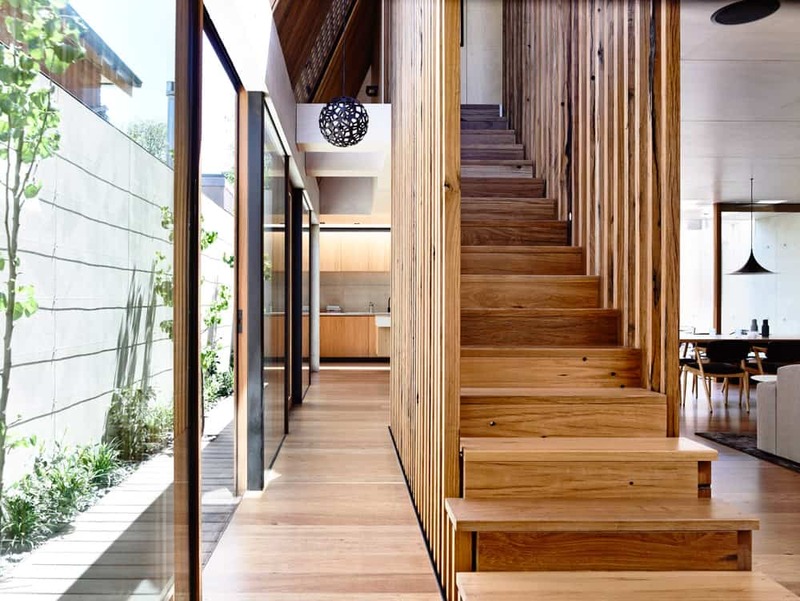 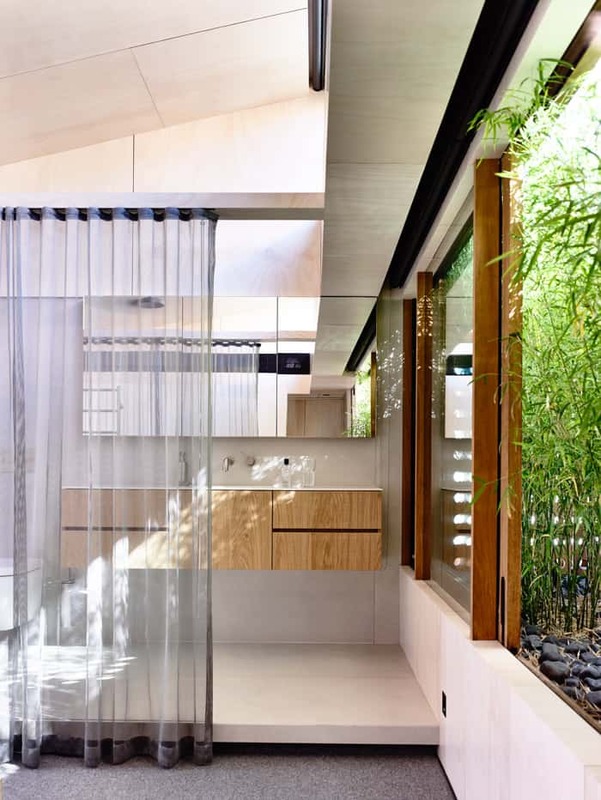 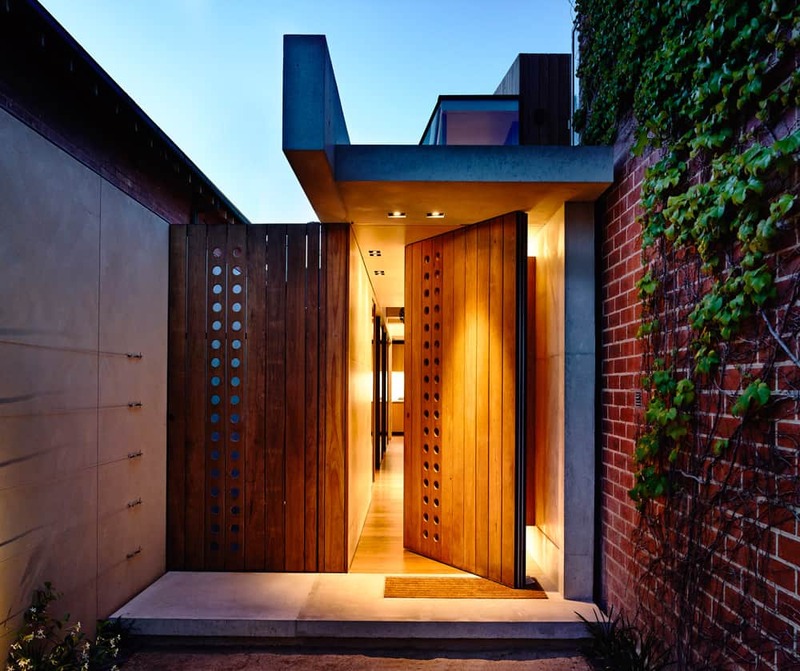 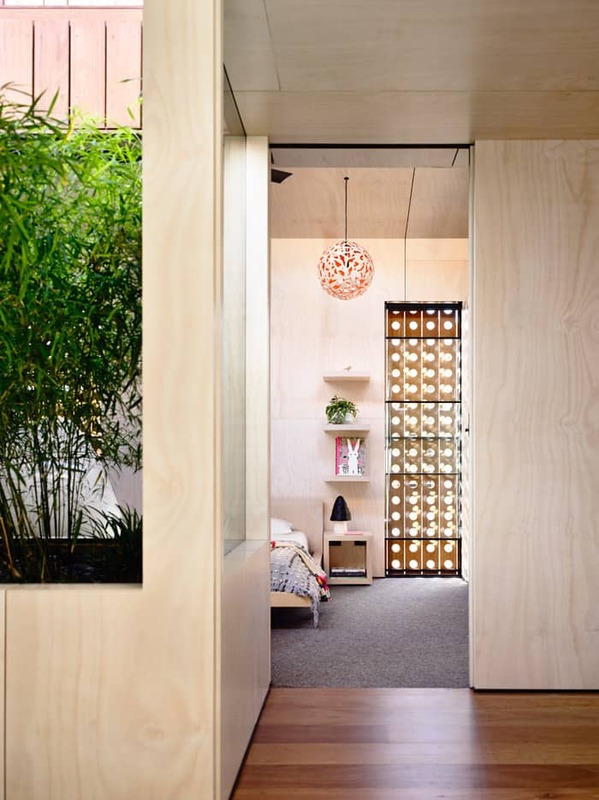 An innovative new home in Melbourne’s beachside suburb of Elwood strikes a serene balance between openness and privacy. 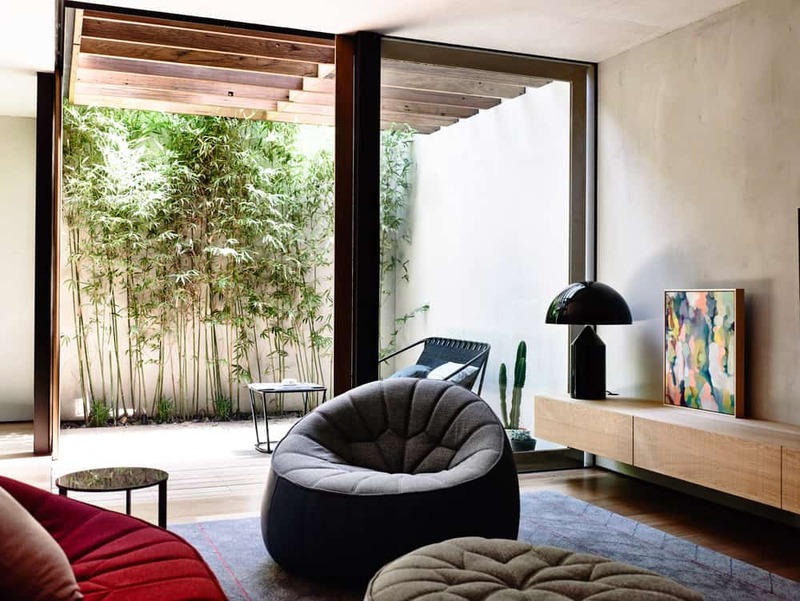 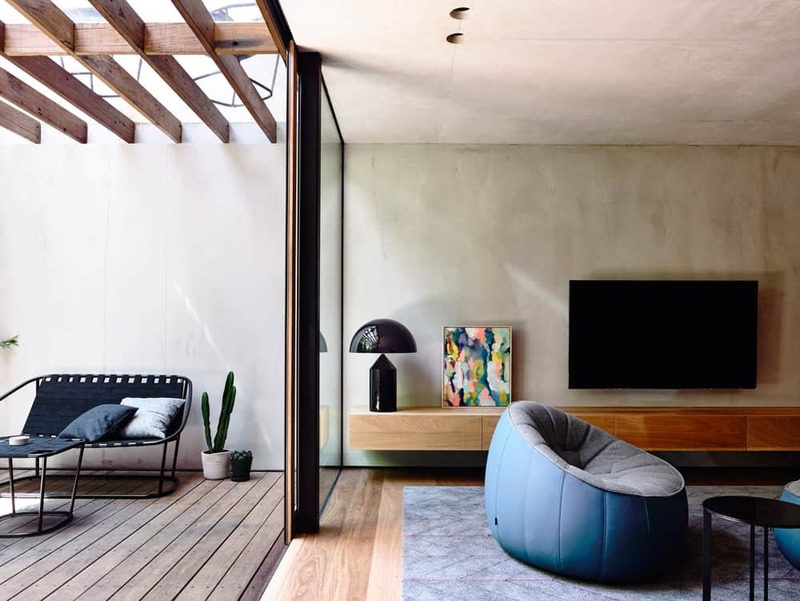 Hidden down a narrow lane to the rear of a neighbouring property lies the modern, multi-storey jewel – a private sanctuary of free-flowing open living that makes use of every square inch of its inner-suburban landscape. 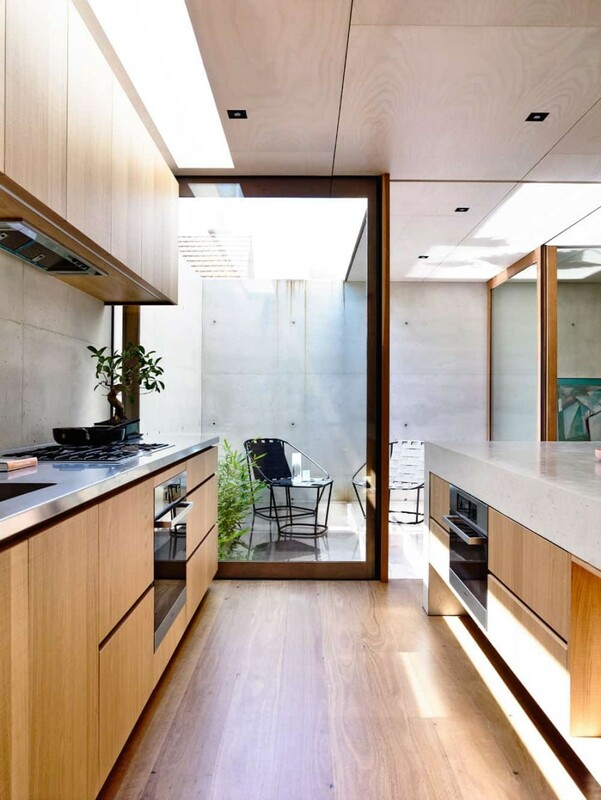 Masterful use of concrete, timber and generous full height glass windows and doors complete a new standard for open residential living on a humble plot. 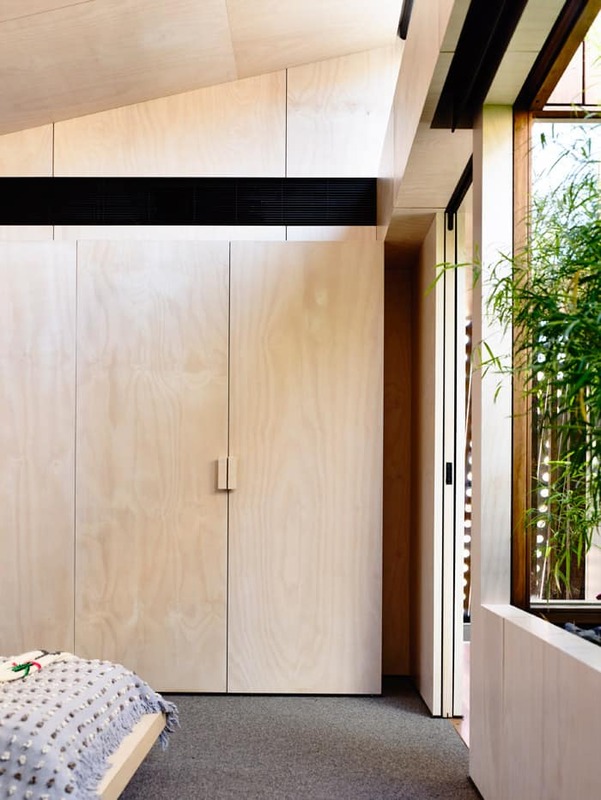 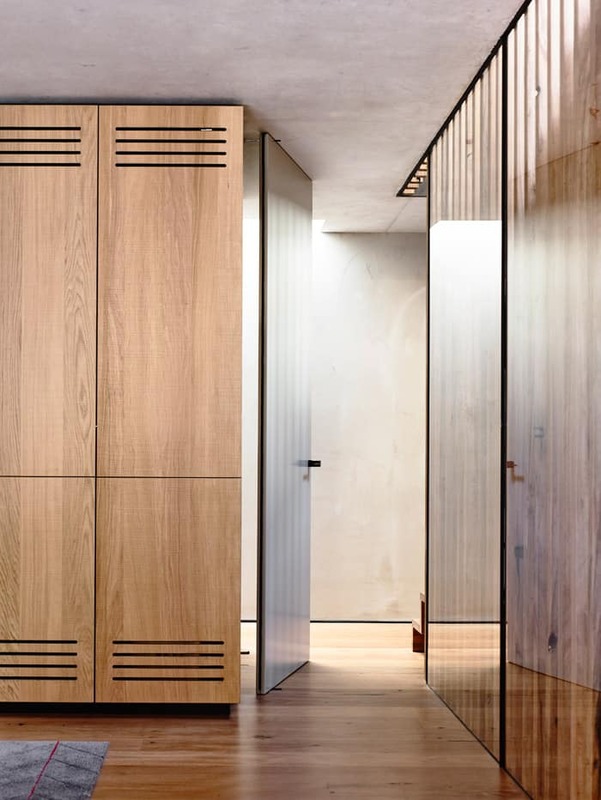 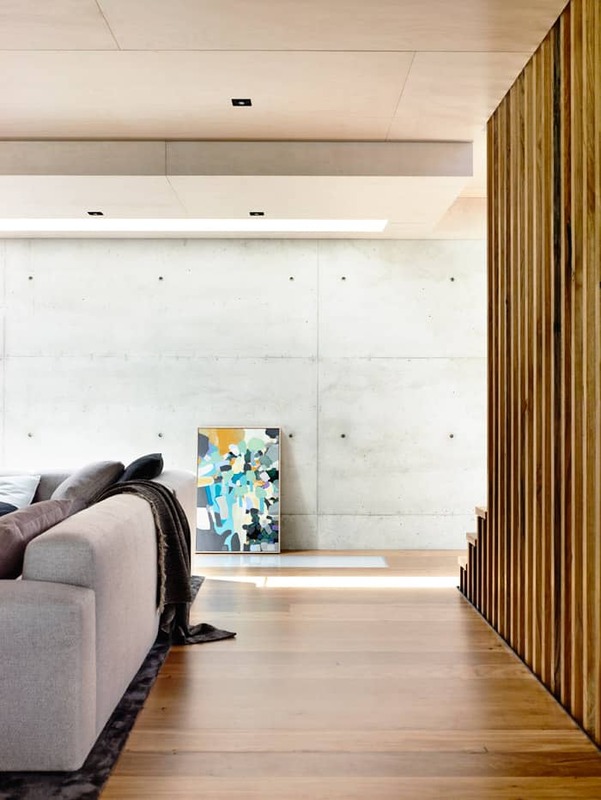 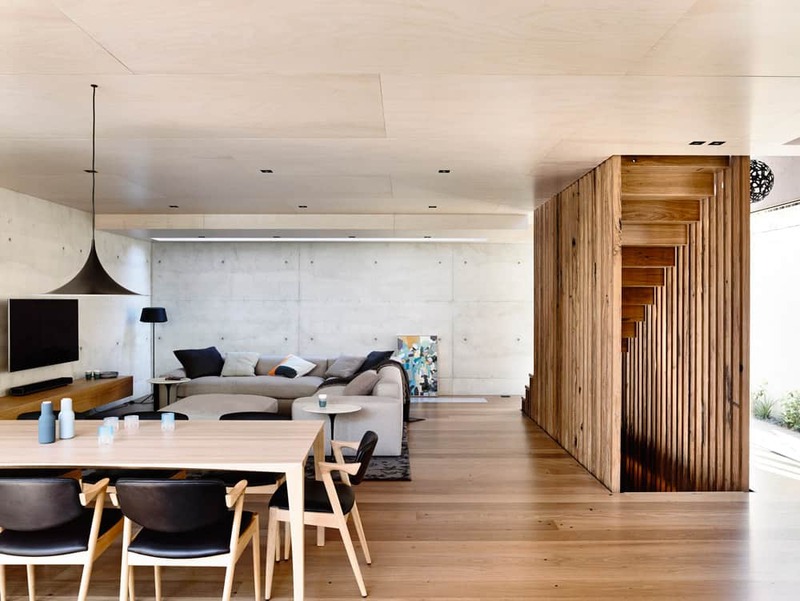 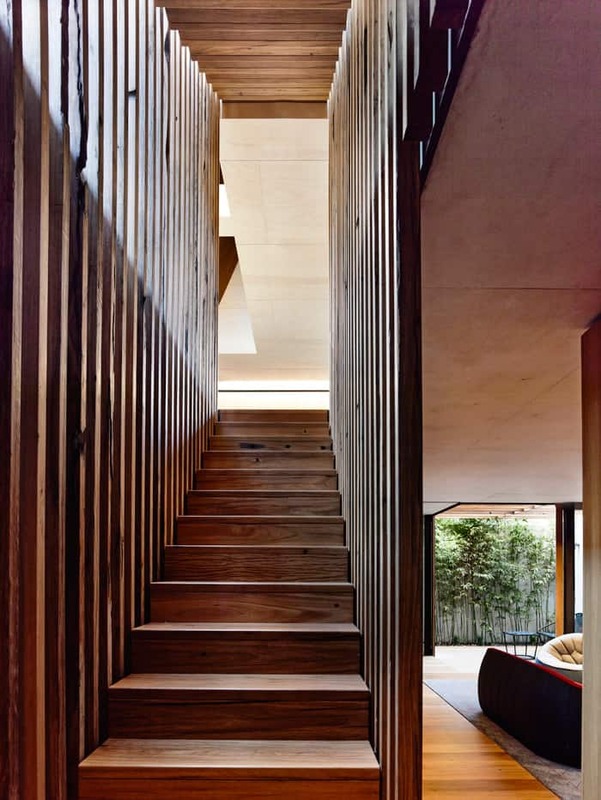 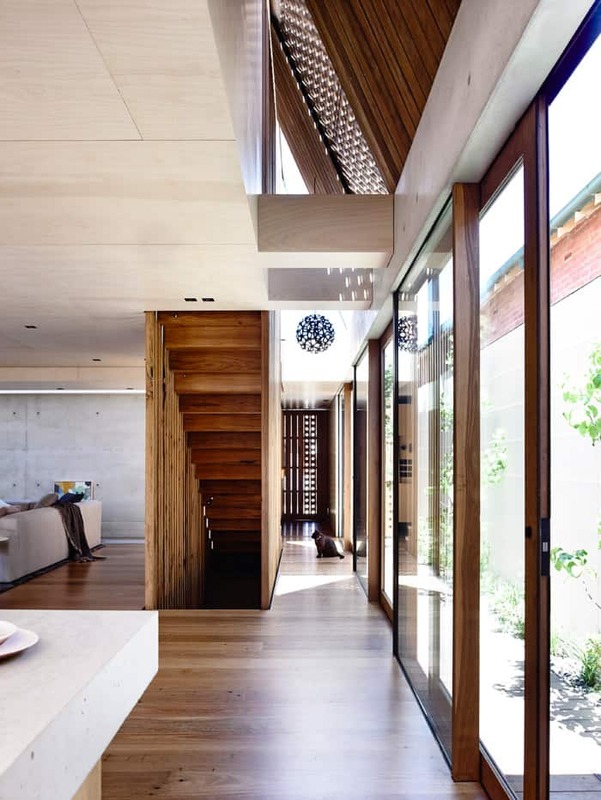 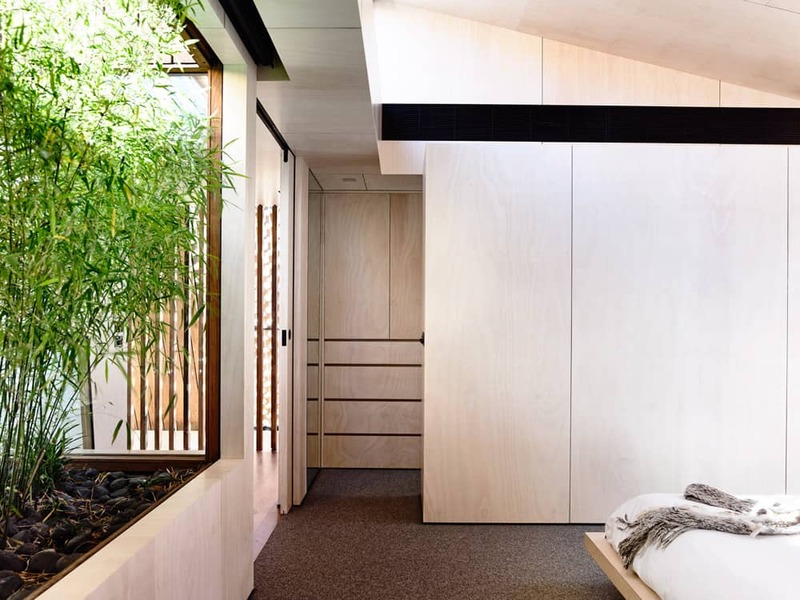 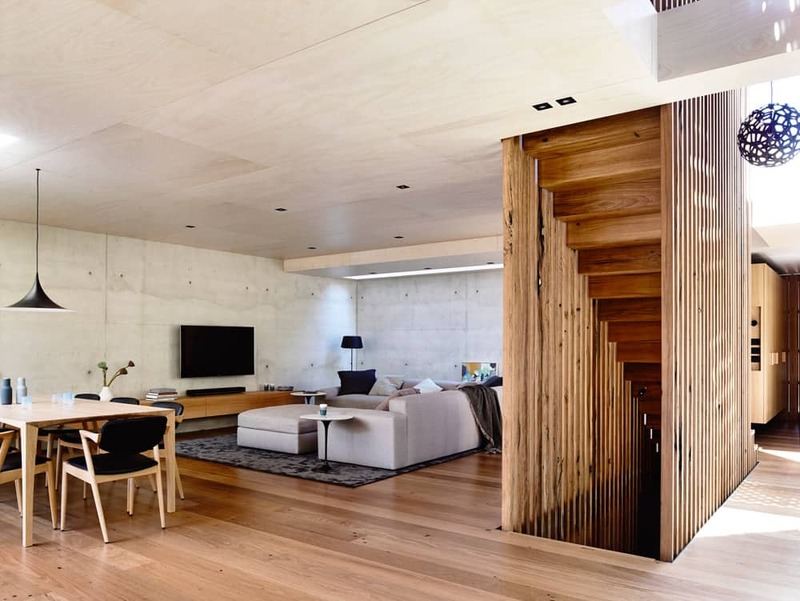 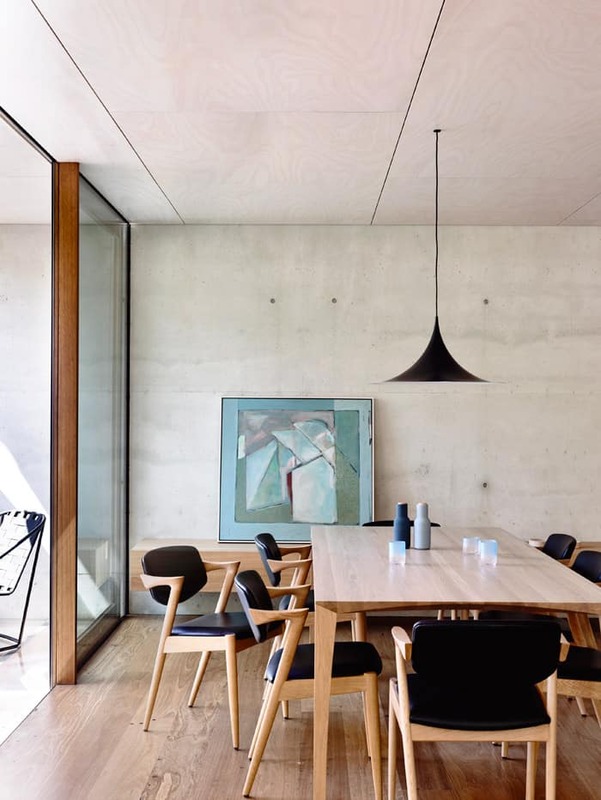 The use of hard materials delivers rigidity, softened by the warm tones of Recycled tallow wood timber on the floors and limed hoop pine timber on ceilings. 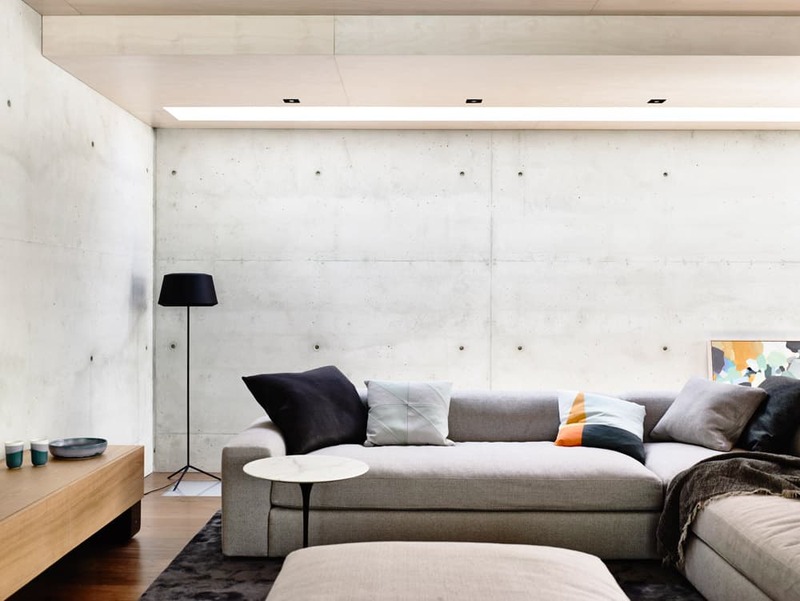 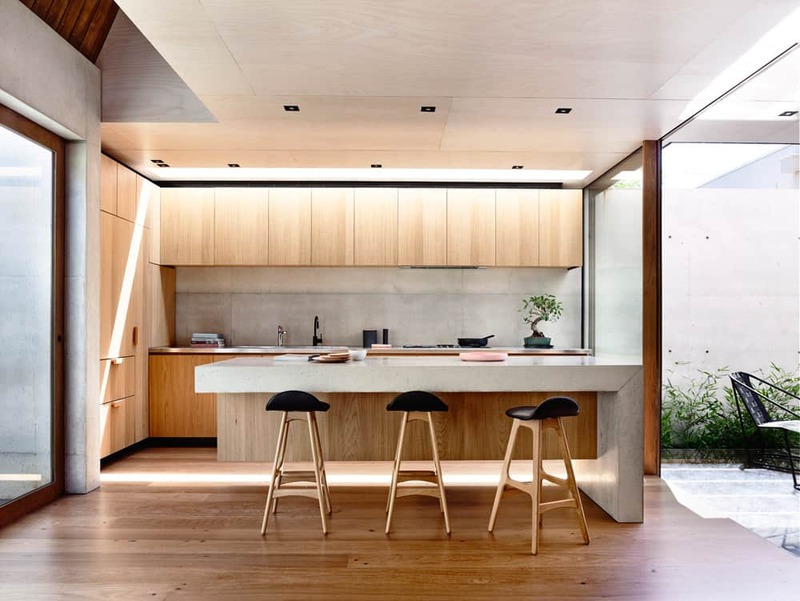 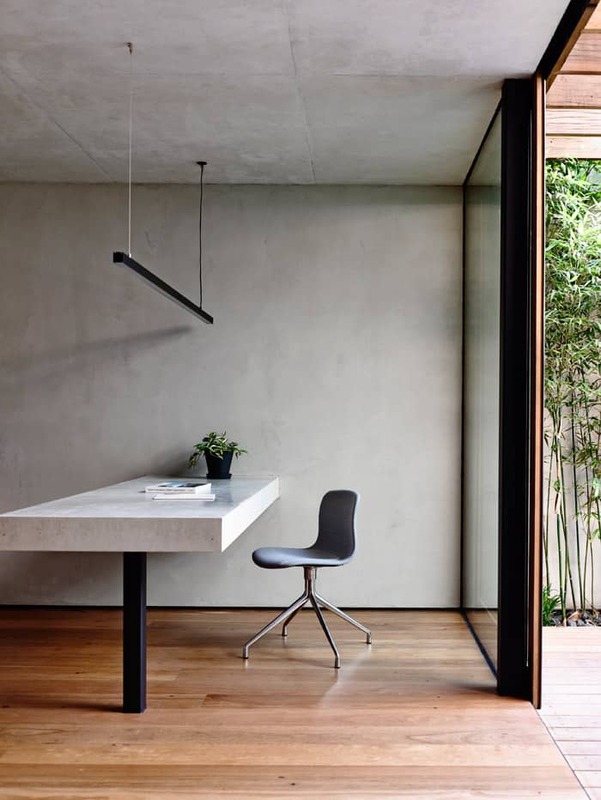 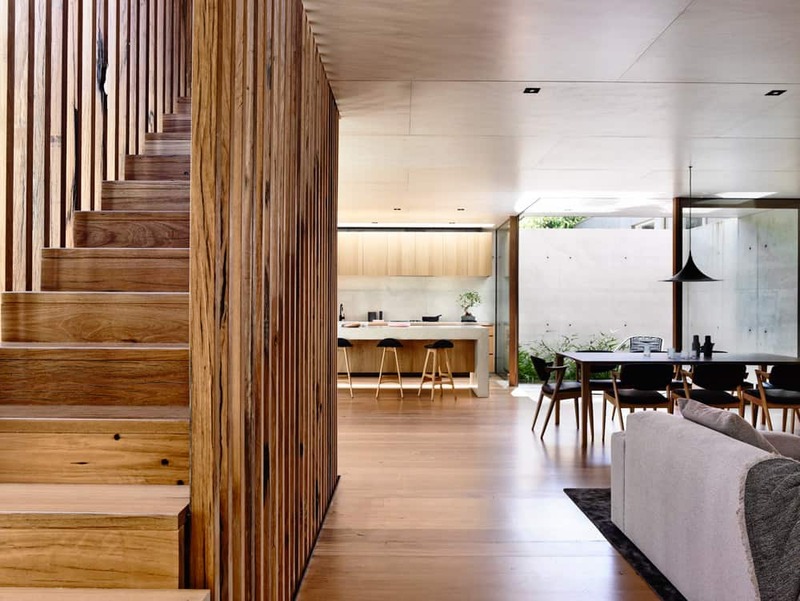 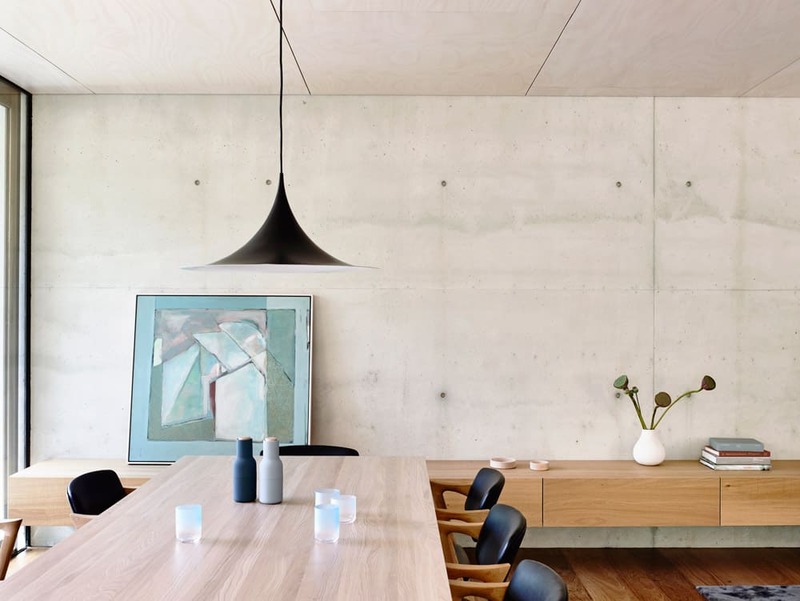 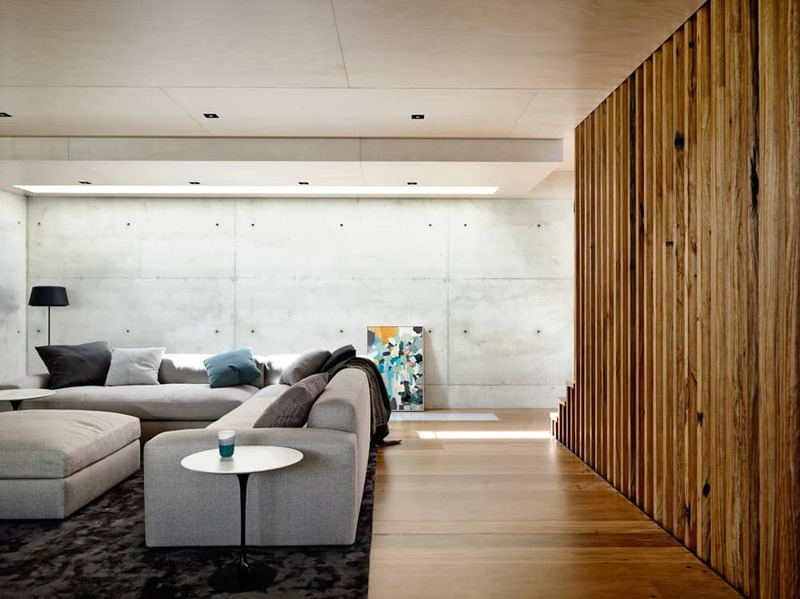 Features range from clever to breathtaking, and include custom-built timber cabinetry and benches, a concrete table in the home office seemingly extending from the house itself, a floating cantilevered concrete island kitchen bench and recycled tallow wood cladding. 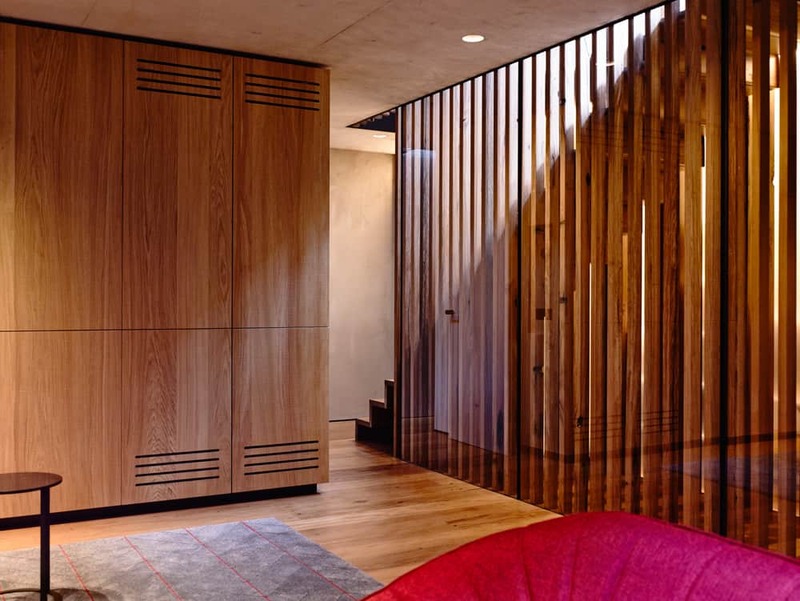 The main bedrooms have en-suites within, separated by glass partitioning, which feel intrinsically part of the retreat. 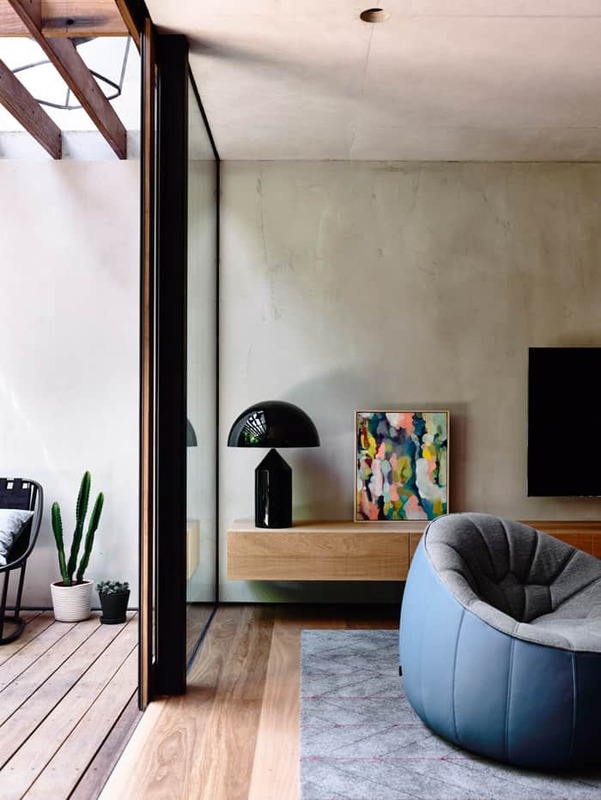 Courtyards on all three levels provide a spacious feeling and meld seamlessly with adjoining rooms, providing abundant light without intrusion. 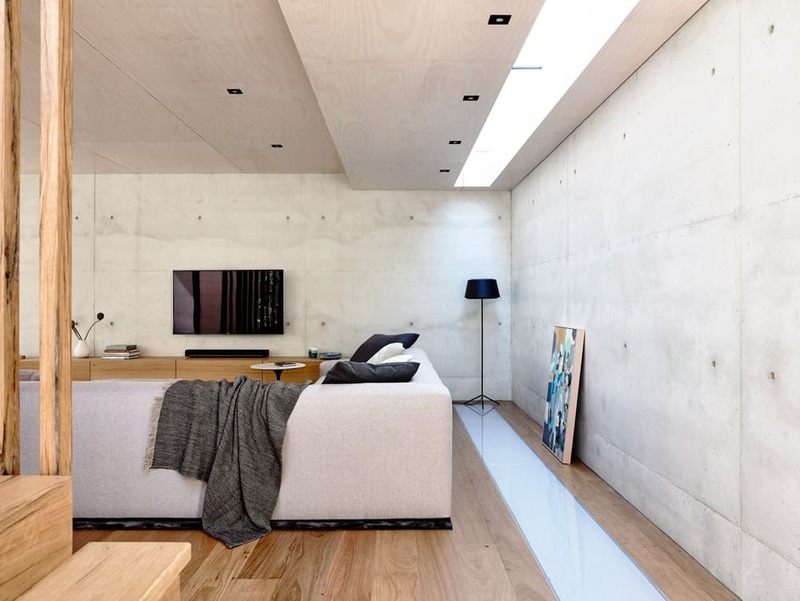 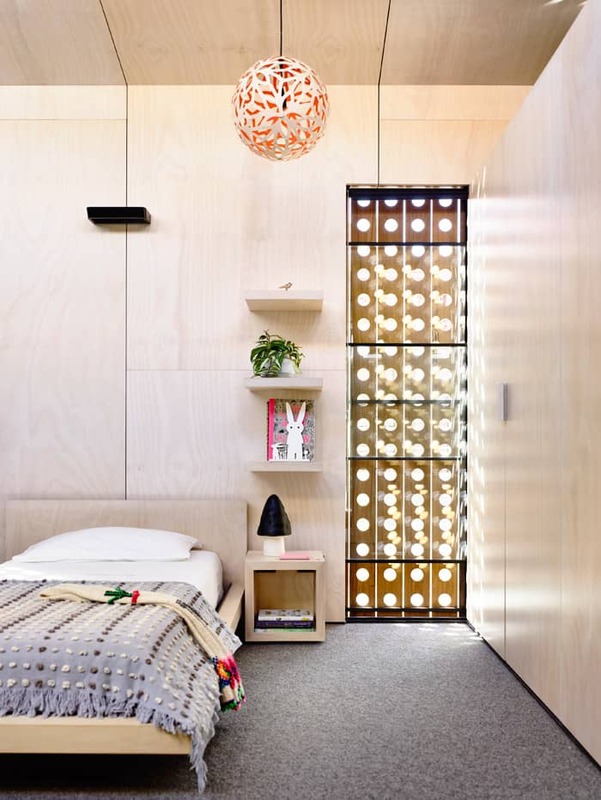 Intelligent space-saving touches can be found throughout and include a bed stored in the wall for maximum space. 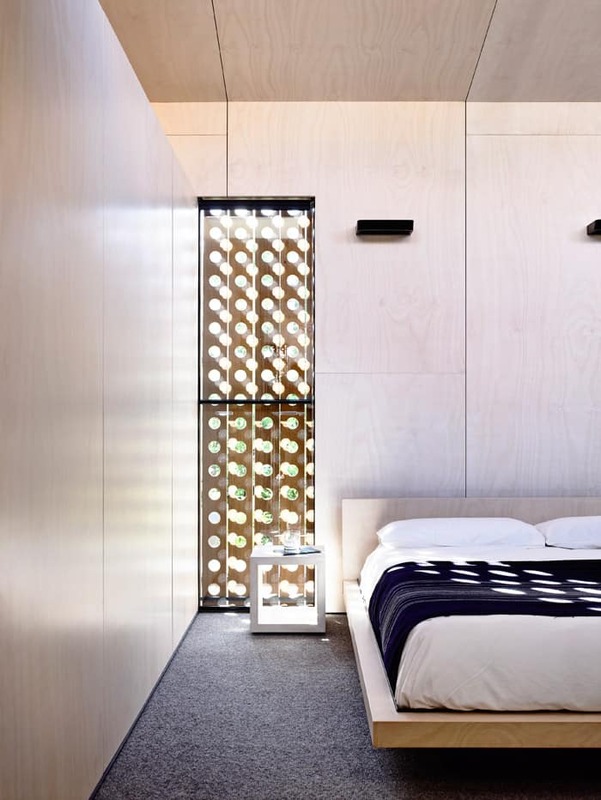 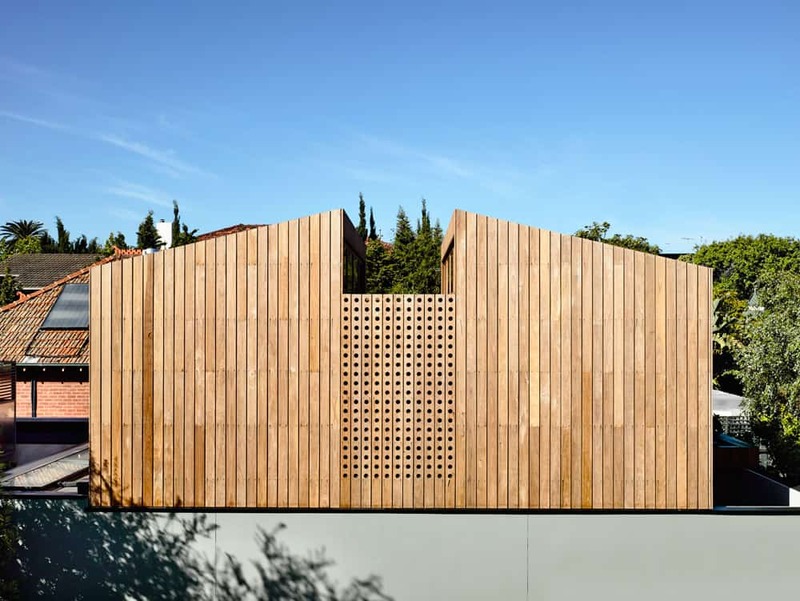 The striking, wooden-clad exterior displays practical and decorative screens, specially designed to maintain privacy for neighbouring properties. 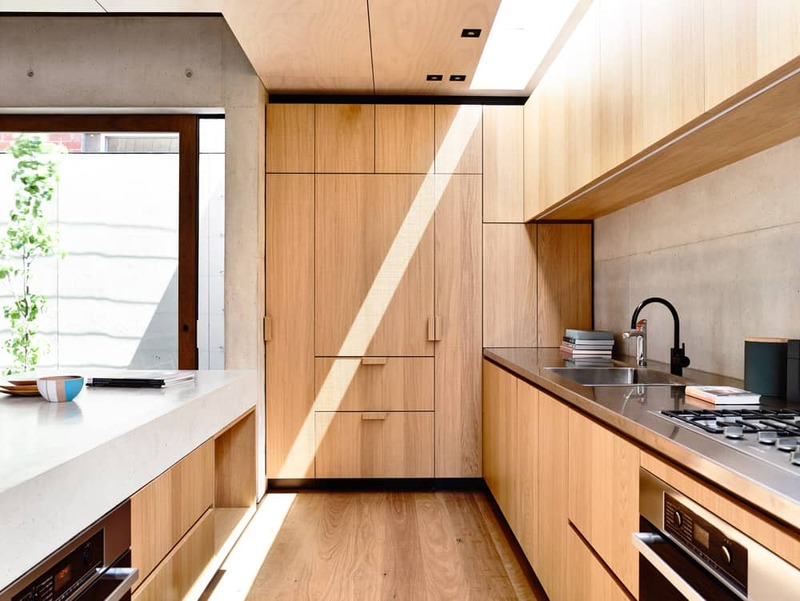 HOUSES Kitchens + Bathrooms Issue 11 (page 109 to 115) Click through to view the entire issue.